Friday, September 14 at 8:00 p.m. 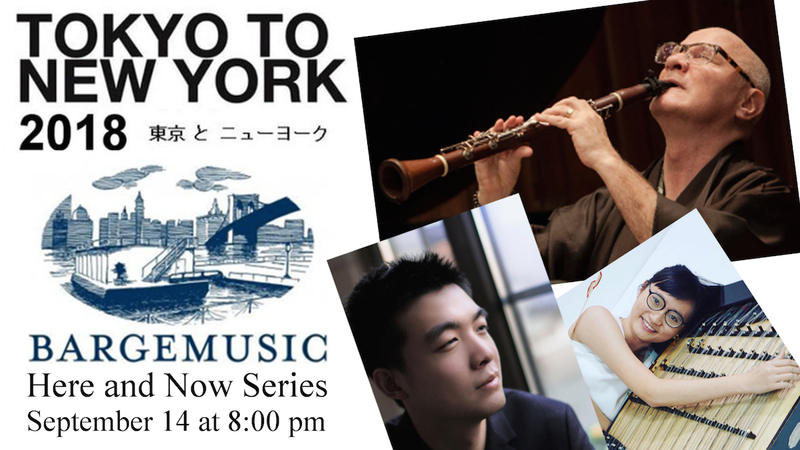 The latest “Tokyo to New York” concert on Bargemusic‘s “Here and Now Series” features new music by composers from Tokyo and New York City. They range in age from 25 to 94 years of age and come from all walks of life and experience: from university students pursuing their doctorate degrees in music to university professors; from composers at the beginning of their professional careers to composers who have won such prominent awards as the Pulitzer Prize, the Grammy Award, the Fulbright Award, the Geneva Award, and the Takemitsu Award. The concert includes several world premieres and United States premieres of music composed for clarinetist/hichiriki player Thomas Piercy. Since 2012, Piercy has performed more than 100 world premieres and numerous Japan and United States premieres in the “Tokyo to New York” concerts, and has had the opportunity to work with the composers programmed in this concert. Composer Morita will travel from Tokyo for the concert, and NYC composers Besingrand, Chen, Han, and Luedeke will also be in attendance. To purchase tickets, please visit Bargemusic’s Brown Paper Tickets site.